The allegations of ‘Russian meddling’ only make sense if they’re put into a broader geopolitical context. Once we realize that Washington is implementing an aggressive “containment” strategy to militarily encircle Russia and China in order to spread its tentacles across Central Asian, then we begin to understand that Russia is not the perpetrator of the hostilities and propaganda, but the victim. The Russia hacking allegations are part of a larger asymmetrical-information war that has been joined by the entire Washington political establishment. The objective is to methodically weaken an emerging rival while reinforcing US global hegemony. Try to imagine for a minute, that the hacking claims were not part of a sinister plan by Vladimir Putin “to sow discord and division” in the United States, but were conjured up to create an external threat that would justify an aggressive response from Washington. That’s what Russiagate is really all about. US policymakers and their allies in the military and Intelligence agencies, know that relations with Russia are bound to get increasingly confrontational, mainly because Washington is determined to pursue its ambitious “pivot” to Asia plan. In short, the US is determined to maintain its global supremacy by establishing military outposts across Eurasia, continuing to tighten the noose around Russia and China, and reinforcing its position as the dominant player in the most populous and prosperous region in the world. 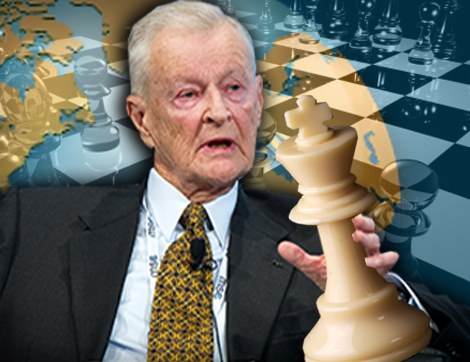 The plan was first presented in its skeletal form by the architect of Washington’s plan to rule the world, Zbigniew Brzezinski. 14 years after those words were written, former Secretary of State Hillary Clinton took up the banner of imperial expansion and demanded a dramatic shift in US foreign policy that would focus primarily on increasing America’s military footprint in Asia. It was Clinton who first coined the term “pivot” in a speech she delivered in 2010 titled “America’s Pacific Century”. The pivot strategy is not some trifling rehash of the 19th century “Great Game” promoted by think-tank fantasists and conspiracy theorists. It is Washington’s premier foreign policy doctrine, a ‘rebalancing’ theory that focuses on increasing US military and diplomatic presence across the Asian landmass. Russian President Vladimir Putin has been equally critical of Washington’s erratic behavior. NATO’s eastward expansion has convinced Putin that the US will continue to be a disruptive force on the continent for the foreseeable future. Both leaders worry that Washington’s relentless provocations will lead to an unexpected clash that will end in war. Even so, the political class has fully embraced the pivot strategy as a last-gasp attempt to roll back the clock to the post war era when the world’s industrial centers were in ruins and America was the only game in town. Now the center of gravity has shifted from west to east, leaving Washington with just two options: Allow the emerging giants in Asia to connect their high-speed rail and gas pipelines to Europe creating the world’s biggest free trade zone, or try to overturn the applecart by bullying allies and threatening rivals, by implementing sanctions that slow growth and send currencies plunging, and by arming jihadist proxies to fuel ethnic hatred and foment political unrest. Clearly, the choice has already been made. Uncle Sam has decided to fight til the bitter end. Washington has many ways of dealing with its enemies, but none of these strategies have dampened the growth of its competitors in the east. China is poised to overtake the US as the world’s biggest economy sometime in the next 2 decades while Russia’s intervention in Syria has rolled back Washington’s plan to topple Bashar al Assad and consolidate its grip on the resource-rich Middle East. That plan has now collapsed forcing US policymakers to scrap the War on Terror altogether and switch to a “great power competition” which acknowledges that the US can no longer unilaterally impose its will wherever it goes. Challenges to America’s dominance are emerging everywhere particularly in the region where the US hopes to reign supreme, Asia. This is why the entire national security state now stands foursquare behind the improbable pivot plan. It’s a desperate “Hail Mary” attempt to preserve the decaying unipolar world order. What does that mean in practical terms? It means that the White House (the National Security Strategy) the Pentagon (National Defense Strategy) and the Intelligence Community (The Worldwide Threat Assessment) have all drawn up their own respective analyses of the biggest threats the US currently faces. Keep in mind, the US does not feel threatened by the possibility of a Russian attack, but by Russia’s ability to thwart Washington’s grandiose imperial ambitions in Asia. “Threats to US national security will expand and diversify in the coming year, driven in part by China and Russia as they respectively compete more intensely with the United States and its traditional allies and partners…. We assess that Moscow will continue pursuing a range of objectives to expand its reach, including undermining the US-led liberal international order, dividing Western political and security institutions, demonstrating Russia’s ability to shape global issues, and bolstering Putin’s domestic legitimacy. We assess that Moscow has heightened confidence, based on its success in helping restore the Asad regime’s territorial control in Syria,… Russia seeks to boost its military presence and political influence in the Mediterranean and Red Seas… mediate conflicts, including engaging in the Middle East Peace Process and Afghanistan reconciliation…. Notice how the Intelligence Community summary does not suggest that Russia poses an imminent military threat to the US, only that Russia has restored order in Syria, strengthened ties with China, emerged as an “honest broker” among countries in the Middle East, and used the free market system to improve relations with its trading partners and grow its economy. The gas pipelines and high-speed rail are the arteries that will bind the continents together and strengthen the new EU-Asia superstate. This is Washington’s greatest nightmare, a massive, thriving free trade zone beyond its reach and not subject to its rules. “Slow down or prevent it”? Why? Because EU-Asia growth and prosperity will put pressure on US debt markets, US corporate interests, US (ballooning) national debt, and the US Dollar? Is that why Hillary is so committed to sabotaging Putin’s economic integration plan? Indeed, it is. Washington wants to block progress and prosperity in the east in order to extend the lifespan of a doddering and thoroughly-bankrupt state that is presently $22 trillion in the red but continues to write checks on an overdrawn account. But Russia shouldn’t be blamed for Washington’s profligate behavior, that’s not Putin’s fault. Moscow is merely using the free market system more effectively that the US. Now consider the Pentagon’s 2018 National Defense Strategy (NDS) which reiterates many of the same themes as the other two documents. “China and Russia are now undermining the international order from within the system……. Get the picture? China and Russia, China and Russia, China and Russia. Bad, bad, bad. Why? Because they are successfully implementing their own development model which is NOT programed to favor US financial institutions and corporations. That’s the whole thing in a nutshell. The only reason Russia and China are a threat to the “rules-based system”, is because Washington insists on being the only one who makes the rules. That’s why foreign leaders are no longer falling in line, because it’s not a fair system. The USG is unanimous in its judgement that a harsher more combative approach is needed to deal with Russia and China. Foreign policy elites want to put the nation on the path to more confrontation, more conflict and more war. At the same time, none of these three documents suggest that Russia has any intention of launching an attack on the United States. The greatest concern is the effect that emerging competitors will have on Washington’s provocative plan for military and economic expansion, the threat that Russia and China pose to America’s tenuous grip on global power. It is that fear that drives US foreign policy. And this is broader context into which we must fit the Russia investigation. The reason the Russia hacking furor has been allowed to flourish and spread despite the obvious lack of any supporting evidence, is because the vilifying of Russia segues perfectly with the geopolitical interests of elites in the government. The USG now works collaboratively with the media to influence public attitudes on issues that are important to the powerful foreign policy establishment. The USG now sees the minds of ordinary Americans as a legitimate target for their influence campaigns. They regard attitudes and perceptions as “the cognitive domain of the battlespace” which they must exploit in order to build public support for their vastly unpopular wars and interventions. The relentless Russiagate narrative (which was first referred to the FBI by the chief architect of the Syrian War, former-CIA Director John Brennan) represents the disinformation component of the broader campaign against Russia. Foreign policy elites are determined to persuade the American people that Russia constitutes a material threat to their security that must be countered by tighter sanctions, more sabre-rattling, and eventually war.